TUCKER NAMED BPA GM OF THE YEAR: Stuart Tucker bested Ed Beach, by seven points, leaving Ed in the bridesmaid position for the second year in a row in the annual BPA GM of the Year vote. The Hannibal GM will receive free lodging at WBC 2011 in gratitude for his service. Overall, scores ranged from Stuart’s 76 to a low of 17 for the 12 nominees. The Board’s eight first-place votes were split among six nominees. Taking his fourth Top Six nomination with one of those first place votes was Ed Beach, who garnered a score of 69 for hosting Here I Stand, with extra consideration for his work in the Juniors room and the Great Campaigns event. Marc Houde garnered his first Top Six honors to finish third with 63 points for hosting Robo Rally. Rounding out the remainder of our Top Six GMs were John Weber (Puerto Rico) and Claire Brosius (Ticket to Ride) with identical scores of 57, and Larry Lingle whose decoration of the Marietta Room transformed it into a veritable Pirates of the Caribbean ride was good enough for a score of 56, as Cap’n Larry drew 100 cutthroats to Pirate’s Cove. Well done all. Our sincere thanks to you and all others like you who try to make WBC a little more special every year. For more details see http://www.boardgamers.org/wbc/topgm.htm. WBC TRIAL EVENTS ANNOUNCED: BPA thanks its members for their participation in the voting process during the 2011 Membership Drive which determined this year's 25 Continuing Trial events. The selected events are now eligible for inclusion in WBC 2011 upon receipt of a suitable event form by Feb. 28 from a current BPA member willing to serve as the GM. Events for which no such GM commitment is forthcoming will be replaced by BPA from those on the Alternate list. Vendors and sponsors may also select events from the Alternate list or altogether different events provided they have a GM commitment. To be added to the Alternate list, an event must have an event form submitted by a current member acting as the GM. Battleline once again led all candidates. In addition, A House Divided made good its return after a six-year absence by again being	voted back into the fold for 2011. The big winner was GMT which won admission for all nine of its events on the ballot; six returnees and three new games. The hard luck losers of the vote were Goa and Tikal	which fell just beneath the cut after seven- and 11-year runs respectively. Other veteran events failing to make the cutoff included War of 1812 (12 years), Republic of Rome (20 years) and Tyranno Ex (17 years). View the current WBC 2011 lineup on the Orphans Page, which will be updated weekly between now and March when GM submissions end. The complete voting results are available at http://www.boardgamers.org/wbc/trialvote.htm. Vendors/Sponsors are likewise reminded to submit or authorize their 2011 Trial Events by Feb 28. We also are in need of a few Juniors events and Seminar speakers. Contact us with any suggestions for same. WAM IX ALMOST HERE: The new Washington's War headlines a quartet of CDW tournaments including Hannibal, Combat Commander and Twilight Struggle which will be offered for the four day-conference in addition to the usual slate of Open Gaming opportunities. For more information on the Jan. 27–30 convention to be held in the Timonium, MD Holiday Inn, see http://www.boardgamers.org/specific/wam11ann.htm. GM RESERVATIONS: All WBC GMs are reminded that their "reservations"	for events they ran in 2010 expired on Jan. 1. To retain GM status of your event, you must submit a new event form at http://www.boardgamers.org/forms/SubmitEvent.php and renew your membership. Many events are currently listed as OPEN on the Orphans List for lack of a GM's commitment. Those in Pre-Con slots will lose that status if a GM is not forthcoming soon. See the current lineup and GM vacancies at http://www.boardgamers.org/wbc/orphans.htm. QUEEN GAMES AT WBC: BPA is pleased to announce the sponsorship of a major European games publisher at WBC in 2011. The publisher of Alhambra and Chicago Express among many others will be hosting a major dedicated demonstration area similar to Cafe Jay to introduce their extensive game line to an American audience. To get an advance peek at their games see http://www.queen-games.de/ or check out their link in our Exhibitor section whenever visiting our home page. We are currently looking for volunteers to GM events for three of their titles this summer: Chicago Express, Fresco and Samarkand. 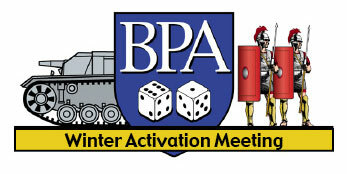 2010 PATRONS: The BPA's list of 2010 Patrons is now posted at http://www.boardgamers.org/wbc/patrons.htm. Please report any inaccuracies to conventiondirector@boardgamers.org no later than	Jan. 31 to ensure an accurate listing in the upcoming Yearbook. BoD NOMINATIONS: All BPA members are hereby notified of their right to nominate members for the three Board seats whose terms expire at the next WBC. To appear on the ballot, members must be nominated in writing by at least three members including themselves. Nominations must be signed and received at BPA, 1541 Redfield Rd, Bel Air, MD 21015 no later than Feb. 28 to be eligible for election in that year. NOTE: Email nominations are NOT acceptable, nor can a member nominate more than one member for the Board. When contemplating nominations, members are urged to consider that the BPA conducts most of its business by email and needs Board members who are able and willing to offer their time and skills to the organization in a timely manner. Board members should be considered more for their ability to contribute to the running of a successful company than for their attachment to any particular game or genre. Besides forwarding a signed nomination for himself/herself, each nominee should submit by	March 1 a statement not to exceed 100 words summarizing what they can contribute in service to the Board of Directors of the BPA. The nomination form is on line at http://www.boardgamers.org/bpanom.htm. DAMCKE WINS AGE OF RENAISSANCE PBeM: Carl Damcke bested a field of 44 to win the latest Age of Renaissance email tournament as the e-mail version continues to outdraw its WBC counterpart. Carl's Paris played a steady game and broke into a big lead on Turn 7 with good leaders and many commodity payouts. Genoa (Thomas Browne) made a strong push on Turn 8 collecting over $250 in silk but it was too little too late. A game long feud between London (Ewan McNay) and Barcelona (Mark Smith) hurt both of their causes and benefited Paris. Venice (Phil Watkins) came in fifth despite Crusading on Turn 3 and having two turns as the sole owner of Holy Indulgence. Dan Leader earned 6th place laurels for the best runner-up performance in the semis. More details and updated laurel totals are now available at http://www.boardgamers.org/yearbook/aorpge.htm#pbem	or follow the results from the source at http://gregstripes.com/aor/2008_progress.html. MARCH MADNESS: Half of the Sweet Sixteen has been determined with Daniel Leader still the only coach to get both his teams that close to the Final Four. To follow the progress of the brackets, see: http://www.nktelco.net/bdmonnin/mm-brack-2011.htm. GETTYSBURG: After five rounds of the Third Gettysburg PBeM tournament, 36 players have been reduced to two as #6 seed Bill Thomson and #8 seed Mike Pacheco battle it out for the title. In the semi-finals, Mike Pacheco’s Rebel forces, bidding 5.0, overcame Dan Overland’s Federals with a 2nd day resignation by the Blue. The results reversed in the other matchup, with Bill Thomson’s Blue forcing a 2nd day concession by Ed Menzel’s Grey, who had bid 5.5. Follow the progress if the event at http://www.wargameacademy.org/G88/2009-PBEM/index.html.